← High end collecting starts here with Code 3. Anyway, i come across ebay and lo and behold, there is a Millennium Falcon item that i didn’t think that i’d ever get and at a dirt cheap price too, outstanding!!! Long story short, i have a really nice piece for my collection and i now trawl ebay looking for items that i now find myself wanting again, spending a fortune and getting in trouble with the missus. Isn’t the internet a wonderful and amazing invention? 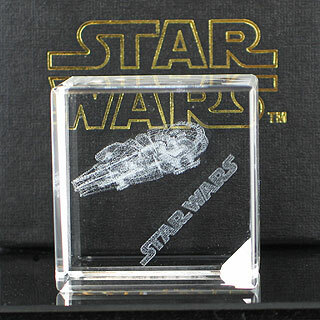 So, for those that are interested and have a similar interest in the Millennium Falcon, i present the Code 3 Laser etched glass cube. 🙂 It came in quite a nice presentation box as well and for $13.99, i’d recommend one.